I’ve been fortunate to see this beauty in the wild near Prudhoe Bay. As I state above I think the Musk Ox and Dahl Sheep are the only Alaskan game animals I haven’t eaten. Pretty goof for a non hunter. My wife has told me multiple times (hubbies can’t hear or comprehend) never to buy her another project she had to make. She forgave me just this once when I brought home a stocking cap pattern and a skein of Qiviut from the Qiviut Co-op in Anchorage. This has become her go to head cover for cold weather. The 46th running of the Iditarod kicked off in earnest on Sunday with its 2:00 pm restart in Willow, AK yesterday (3/4/2018). Above is a spread lifted from my Iditarod journal. It shows the “Vet Book” that all mushers are required to carry from checkpoint to checkpoint. The bright yellow covers make these little, waterproof notebooks easy to spot in the pocket of a sled when the head checkpoint vet needs to sign off on the mandatory vet checks. Above is a journal entry I did when volunteering for the Iditarod in March on drop dogs and the people who care for them. Drop dogs are the dogs that are left behind as the musher and his team continue the race. There are many reasons a dog may be “dropped” at a check point. An injury, dehydration, not eating, etc. Every dog is given a thorough check-up upon arrival at every checkpoint by checkpoint veterinarians. A veterinarian can pull a dog from the team, but, from what I witnessed 99.9% of the decisions to drop a dog were made by the musher. As it should be. They have been with these dogs day-in- day-out since training began in early fall and know these dogs very well. Once the dogs are dropped they are cared for, 24/7, by veterinarians at the checkpoints until they are flown out to central transportation hubs such as Unalakleet or McGrath. Here they are cared for by Vet Techs, professional dog handlers and veterinarians until a plane load has gathered. Then they are flown to Anchorage where they are cared for at the Women’s Prison in Eagle River, AK until they are picked up by their mushers/owners. Iditarod Infographics from the Field. 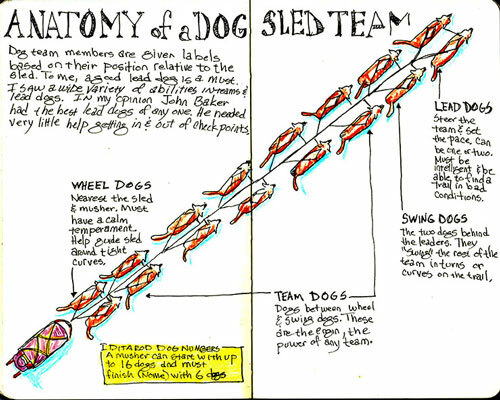 Anatomy of a sled dog team. As Iditarod 2015 heats up with the lead racers hitting the half way mark, here are some info graphics I put together during my stint as a volunteer for the Iditarod in 2012. 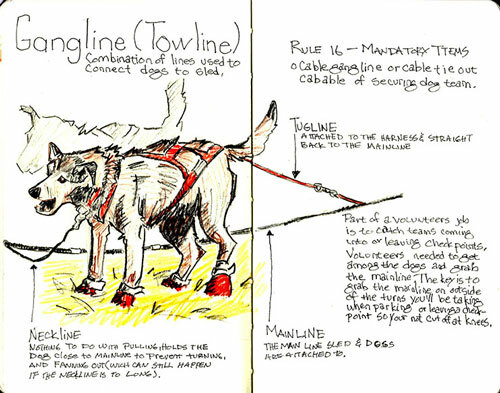 From my Iditarod sketchbook. A quick look at how the dogs are hooked to the sled. From the start of the 2012 Iditarod. The first of the 1000 mile dog sled marathons kicks off today in Whitehorse (Canada) and will finish in about 9 days in Fairbanks (USA). Some of these mushers will compete in another 1000 mile race, The Iditarod, starting a month from now. Not much time to recuperate. To follow the Questers I recommend going to yukonquest.com and using the live tracker option. This is free to use unlike the the Iditarod tracker where you need to become an Insider (well worth it by the way). The image above is from the start of the 2012 Iditarod. I have yet to make the Yukon Quest, but, rest assured it’s on my bucket list. To get you fired-up and in the mood for today’s start of the Yukon Quest, here is one of my favorites, a video of the 2012 start in Fairbanks put together by Mark Gillett and Tom Barber. The main focus this week is the Iditarod Dog Sled Race, where mushers leave Willow, Alaska and don’t stop until they reach Nome, 1049 miles later. What is lesser know is the Iditarod Trail Invitational a bike and walker race which follows the same famed route and starts a week before the dog race. Some participants ride fat tire bikes while others walk, pulling sleds. These are tough sons-of-guns. The bike’s tires are fat to let them travel over the same trails that dog teams and snow machines travel. Water needs to be kept from freezing to prevent dehydration. Strategies need to be considered to keep from freezing to death. Image pedaling all day long in sub-zero temperatures. You need to where clothing that will wick moisture and keep you from overheating. But, the minute you stop you need to have access to arctic wear to keep your body temp from plummeting. The pictures above are of Billy Koitzsh (orange) and Bob Ostrom during the 2013 Iditarod Trail Invitational. They are about to leave the Koyuk checkpoint, 180 miles from Nome, after a much needed respite after crossing 50 miles of sea ice over Norton Sound. Billy has lost two toes to frostbite in previous races and was to have another one amputated when he got home. While Bob ended his journey in Nome and won the bike portion of the Invitational, Billy continued on to Fairbanks for a total of 200o miles on snow and ice. DPchallenge. Today was the ceremonial start of the Iditarod. 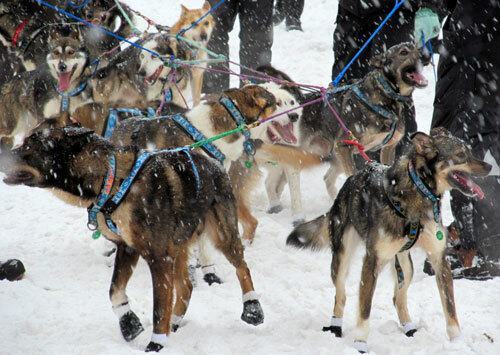 The mushers are obligated to mush from 4th Avenue in Anchorage to Campbell Airstrip, a distance of 11 miles. I was in Anchorage at the ceremonial start in 2012, the first time it snowed in the history of an Iditarod start. 10,000 plus people lined the race route. 50 times that, or more, tuned in via live Alaskan TV coverage and through the internet. Some might ask, why put the mushers through this Spectacle, but, I say its essential. After Anchorage the racers now have to pack everything up and head to Willow for the restart, and, I heard the word bull crap more than once about them having to do this. Some say it puts stress on the mushers and the teams. I think the stress is more on the mushers than the dogs. I’m guessing (and only guessing) that the dogs are used to being loaded and unloaded into the truck for training and conditioning runs. This year in particular, the musher had to drive to where the snow was. Mike Santos (Cantwell, AK) said “It was easier to count the mushers who were not here (Cantwell) than those who were here.” Which meant they were driving to his nick of the woods to train because that’s where the snow was. Nothing happens in a vacuum. As with any sport, it can’t thrive without fans. It would be great if the mushers could go to Willow and head out. I’ve been to Willow during the restart, it stinks. If you’re not with a race official (which I was) you’ve got some long walking to do after you park (sure you may have some walking to do in Anchorage, but your in Anchorage on sidewalks and can window shop), or you can take a shuttle bus from Wasilla. Even the visual is a let down. Instead of 10,000 intoxicated, cheering fans in Anchorage (trust me, they were), the race took off on a frozen lake and the mushers disappeared into the trees. The Iditarod has done it right. They stage the Anchorage start at the end of the Fur Rondy, people are excited, interest is high and potential sponsors are paying attention. The Iditarod is purely Alaskan and without the Anchorage start even Alaskan interest and support would wane. The Anchorage restart is social media in a sense, it introduces the mushers and dog racing to new fans and enthusiasts. The obligation to the mushers does and should end there except for following the rules of the race and carrying the mandatory items to Nome. Speaking of social media some mushers do an excellent job at it—Facebook fan page, Twitter, blog, etc. Few of these mushers run these venues themselves by the way, but, have others (fans, professional social media folks) post for them. So despite the so called intimacy, there is somewhat of a disconnect (hey I’m guessing Lady GaGa doesn’t man her social media 24/7 either, if at all). Then there are mushers like Ramey Smyth, no Facebook fan page, Twitter, or Blog/web page that I could find. He’s done a good job of avoiding social media and self promotion in general. The announcers today said to stay away from him when he’s racing. He is focused and his head is in the race. I assume this is true for most racers and as a volunteer I avoided idle chit chat with the racers for that reason. For the last two years I was a volunteer at the Koyuk Checkpoint. 800 miles into the race where mushers are punch drunk with sleep deprivation after crossing 50 miles of sea ice. Ramey Smyth was the only musher in the two years I was there (with the exception of Rick Swenson in 2012) that, as he was leaving the checkpoint, stopped, got off his sled and shook my hand to thank me for all the hard work I was doing as a volunteer. If what the announcers say is true, it means that much more to me that Ramey took those precious seconds (he finished 20th in 2013 and 3rd in 2012) to say thanks, not once but twice. In summary I like the Anchorage ceremonial start and it should remain. At the same time its interesting to see how certain mushers embrace social media or try to avoid it. There are several kennels who will clog my Facebook newsfeed with updates in the next two weeks and then there are mushers like Ramey, the reason I’m an Iditarod Insider, who I will go out of my way to follow on their quest to Nome. For 2014 as a creative challenge I will attempt to post a “Visual Pun” weekly. A good portion of my posts will come from my sketchbooks about the Iditarod Dog Sled Race, travel adventures with healthy doses of graphic design, and life in general. Hess Creek pull off in color based on Sketch. Lino-cut print of the Iditarod exit trail out of Koyuk. Based off of sketches from trip. From Iditarod Sketch book and inspiration for print. Standing on the railroad bridge in Talkeetna, AK.